WILLEMSTAD - On the occasion of its 190th anniversary, the Centrale Bank van Curaçao en Sint Maarten (CBCS) decided earlier this year to make a donation to two organizations - Nos ta Konektá in Curaçao (who received their donation last month) and Philipsburg Jubilee Library in Sint Maarten, who received a symbolic cheque for the amount of NAf 19,000. Philipsburg Jubilee Library, the only public library in Sint Maarten, was severely damaged by Hurricane Irma on September 6, 2017. Special book collections were destroyed and the computers in the public areas and offices were taken by looters. The internet café was inaccessible. In the meantime, library services have resumed in an adapted format - the building is accessible, while the internet café and the study room are open. The library plays an important role for the citizens of Sint Maarten. In a unique cooperation with the Mental Health Foundation the library also contributes to dealing with the psychological effects of Hurricane Irma. 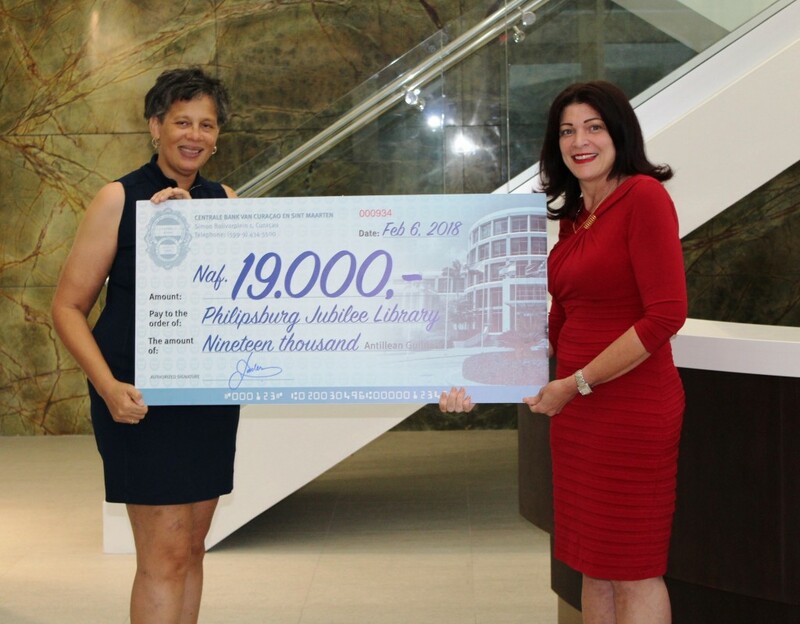 The CBCS is proud to be able to contribute to the important work done by the Philipsburg Jubilee Library. Photo: Acting president of the CBCS, Leila Matroos-Lasten, handing over the symbolic cheque to Monique Alberts, Director of the Philipsburg Jubilee Library.